If you control no monsters, you can Special Summon this card (from your hand). 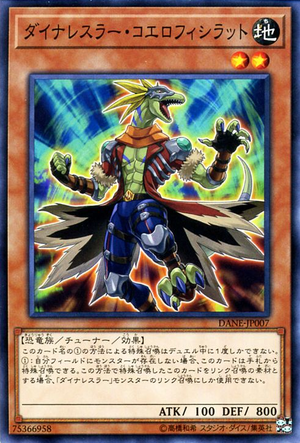 You can only Special Summon "Dinowrestler Coelasilat" once per Duel this way. If Summoned this way, it cannot be used as material for a Link Summon, except for the Link Summon of a "Dinowrestler" monster. 다이너레슬러 코엘로피실랏 이 카드명의 ①의 방법에 의한 특수 소환은 듀얼 중에 1번밖에 할 수 없다. ①: 자신 필드에 몬스터가 존재하지 않을 경우, 이 카드는 패에서 특수 소환할 수 있다.이 방법으로 특수 소환한 이 카드를 링크 소환의 소재로 할 경우, "다이너레슬러" 몬스터의 링크 소환으로밖에 사용할 수 없다. This page was last edited on 19 April 2019, at 18:30.